Happy Monday morning! I hope that you had a fabulous weekend. We had some beautiful weather the past two days in my neck of the woods. It is getting close to that time of the year where you know that you have to savor the great weekends, because before long the fall weather will be moving in. On a little side note before I share my furniture find with you today...I am over-the-moon happy because my painted salad bowl project was featured in a collection on Apartment Therapy over the weekend. It means so much for a website like that to see my work somewhere and choose to include it. There are so many times that I (and I think a lot of bloggers) question if we are getting anywhere with our time and effort. But it is when those great things happen out of the blue that we get a little reassurance that people do enjoy what we put out there into the world. On Friday, I was very excited because my town was having two estate sales. 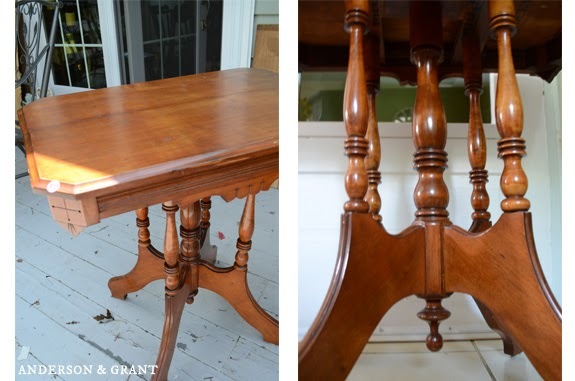 I adore estate sales because you can find some really old pieces, many of which may have been beaten around and "loved" for years.....just what I enjoy looking for. And for there to be two on the same day was practically heavenly. Well, it turns out there was actually only one estate sale (who knew that one road in my town exists broken up in THREE different locations?) and it didn't really have anything left. What the sale did have left was too expensive for the condition. After such disappointment, I was determined to shop around my town until I found something to buy. I was prepared to give up my search and my last stop of the day was one of those yard sales that you consider not stopping at because it looks like a bunch of clothes. But once I was in the driveway, I decided to look through their garage. And what I found was this little table.....for $10! The woman who was selling it told me that her uncle had made it. And when I got it home and flipped it over, I saw that it is stamped with Brockwayville, PA. 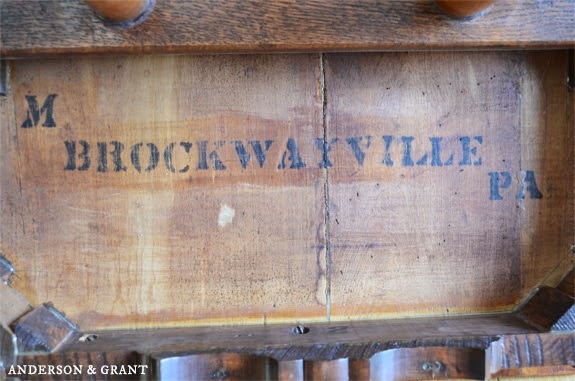 This was my town's name prior to 1925 when it was shortened to Brockway. 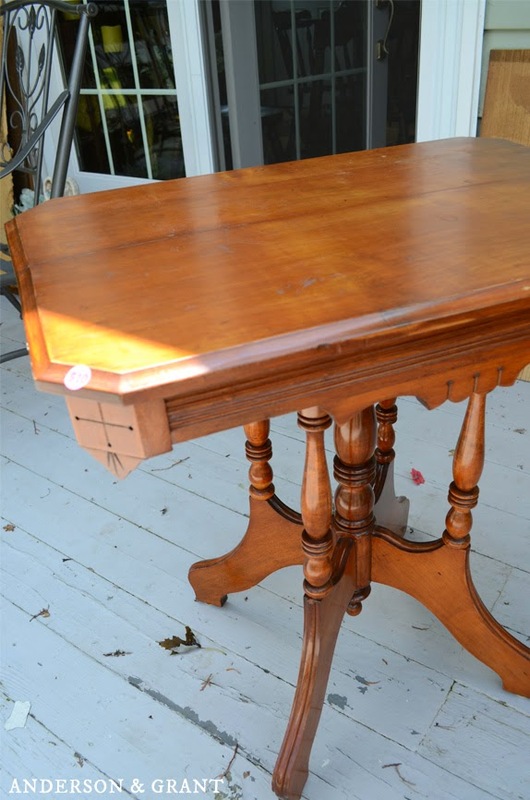 So, not only is my table handcrafted, but it also has to be close to 100 years old. Isn't that exciting? 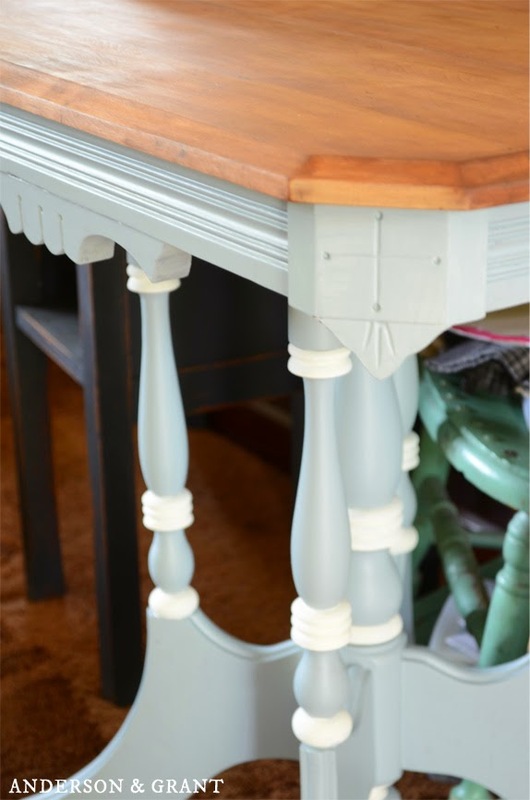 I've already stripped and stained the table top and have painted the base in a French blue with some white details. I plan on finishing it off in the next couple days and will share it with you later in the week. The blue color is kind of scaring me right now, but I'm hoping that after some distressing and antiquing wax it will be perfect. What do you think? 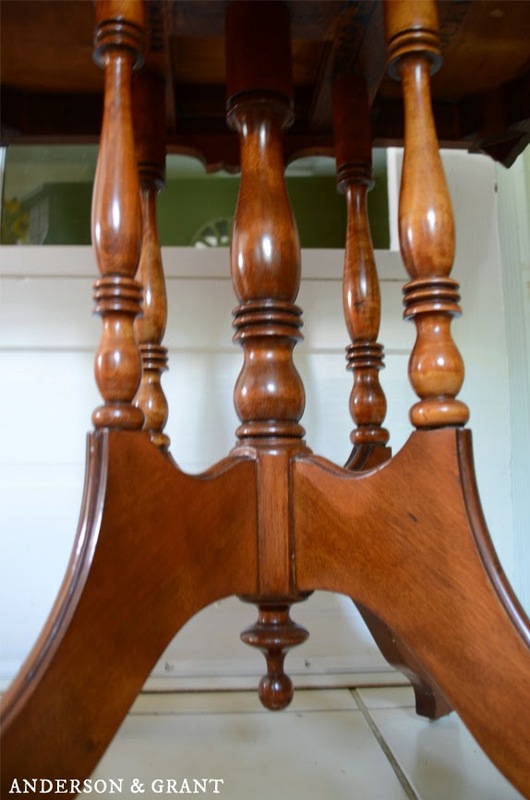 And for those of you who hate seeing a good piece of original wood furniture painted....the entire piece has already been refinished at least once in 1971. It is written on the bottom of the table, too. And it is obvious to the eye that the table top has been varnished over after that and was worn in random places. The top was going to have to be refinished, anyway.